Near Pau, very beautiful property on 194 hectares land, including a magnificient château of 1000 sqm and various outbuildings. This extremely rare property is located in a peaceful neighbourhood and offers a splendid view of the mountains. Bridge over the Gave de Pau "Pau has the most beautiful land view as Naples has the most beautiful sea view" said Lamartine and, indeed, the panoramic view of the Pyrenees from the Boulevard of the same name is absolutely majestic! 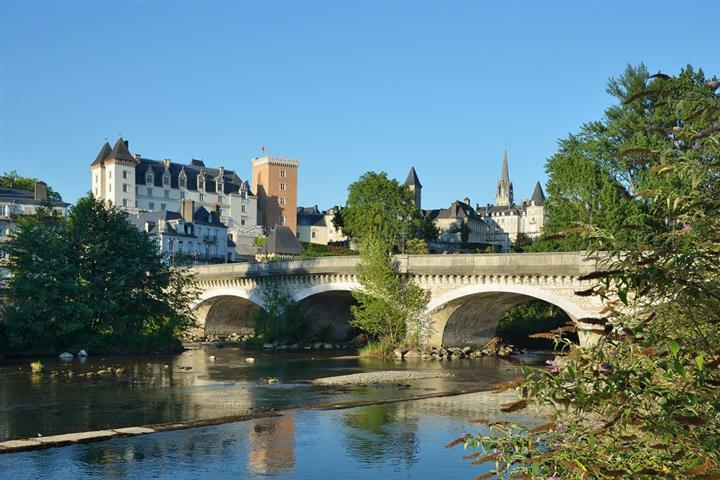 The historic capital of Béarn, Pau enjoys an exceptional location that allows you to spend the day on the ski slopes or surfing beaches. A true garden-city, dotted with lots of green spaces, Pau, a student town on a human scale, is a very pleasant place to live. "Live well, eat well" could be its motto. All you have to do to convince yourself is sit down to eat with the locals of Bearn with a glass of Jurançon in your hand. So why not buy there? Because the real estate market in Pau offers lots of properties at prices which are still very reasonable. You could choose an apartment with a view of the Pyrenees, a traditional Pyrenean residence in the quiet countryside or even a lovely Bearn style village house.